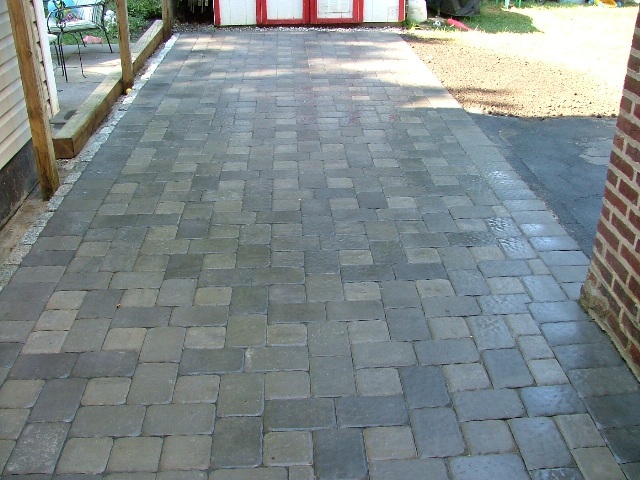 Cobblestones, Belgium Block, River Rock, Brick, EP Henry Curbstone, and other brands of man-made edging are commonly used to provide a border and separate different features in the landscape such as driveways, patios, walks, and lawn areas from plant beds and lawns. 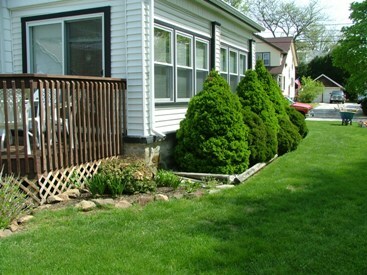 Border and edging stones work well in more level areas where you want a structural divider, but do not need the extra elevation of a wall. 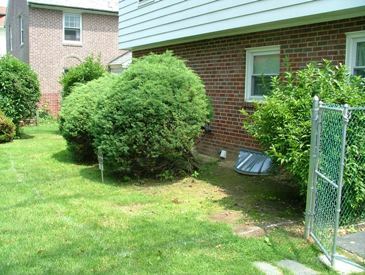 They also work well on slopes where a wall would require many level steps up or down. 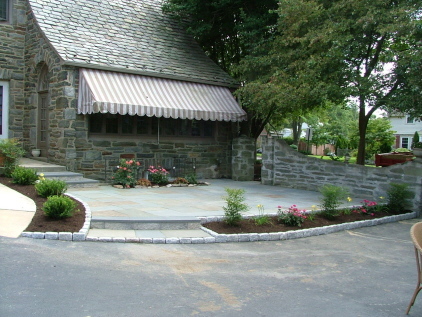 We often use cobblestones to dress up the look of metal window wells; the metal provides the support for the window well, and the cobblestones improve the appearance. 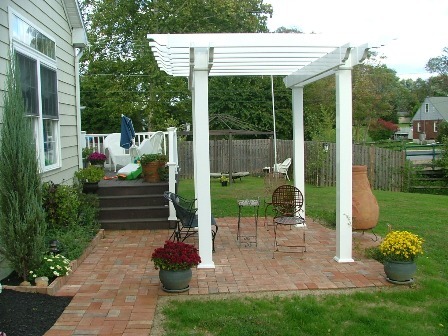 They can also be used as a low step up to a patio or walkway. 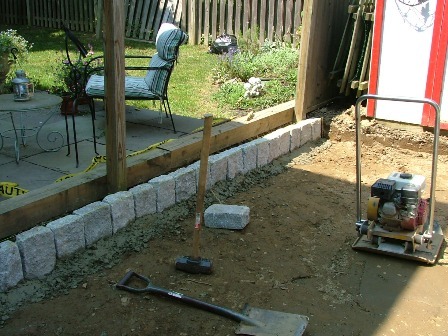 Border stones are often installed in soil when just separating beds from lawns, but sometimes should be installed with concrete at the base when used as an edging along walks, patios, or driveways, and when used as a step. 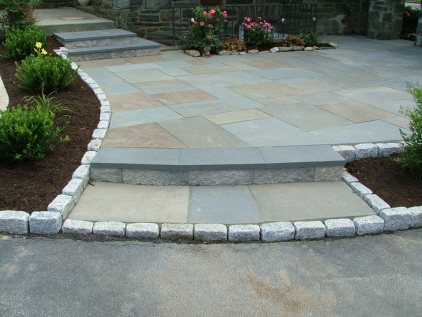 Shown below are examples of different types and uses of edging stones. 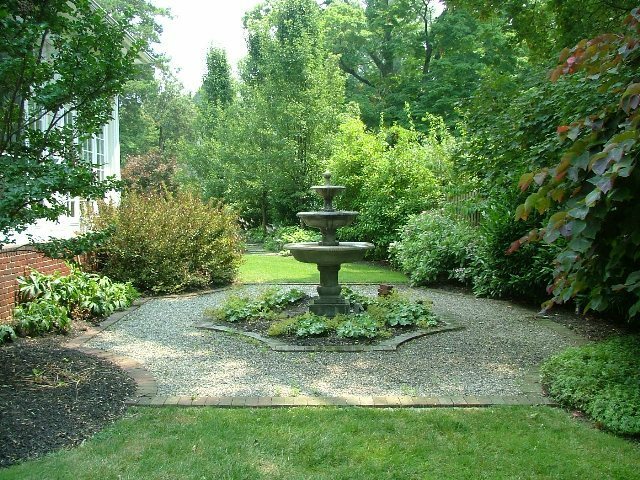 All work shown constructed by Robert J Kleinberg Landscape Design & Construction. 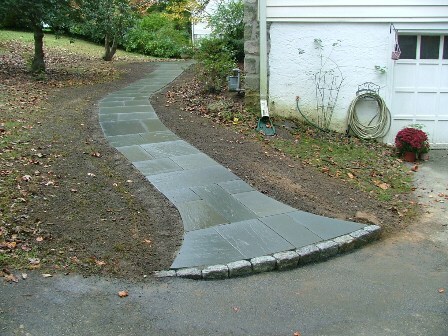 Granite cobble stones or Belgium Block were once used as ballast in ships coming from Europe. 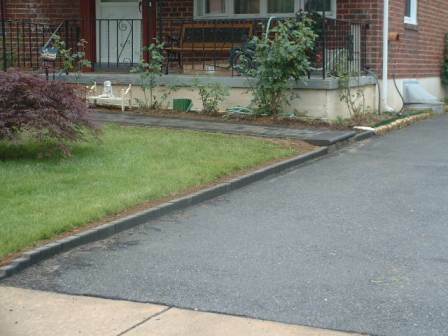 That is why so many streets in older sections of Philadelphia are paved with cobblestones. Traditionally gray with a little black variegations, they now can also be easily found with predominantly pink, tan, and black shades. 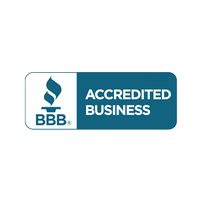 They usually come in jumbo size which is 4″ x 8″ x 11″, gray also comes in regular size which is 4″ x 5″ x 9″. 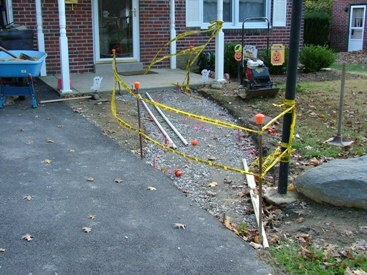 Generally at least half the edger should be buried for stability. Jumbo Cobble stones can be used vertically for more height or horizontally with less height but more length, and therefore less materials and cost. 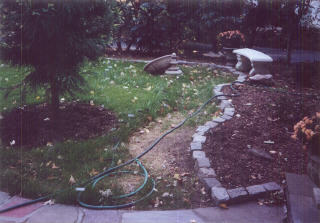 Edgers can be used in hardscaping and landscaping applications. 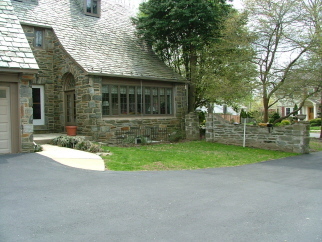 Cobble stones are commonly installed with concrete along driveways and when edging patios and walks. 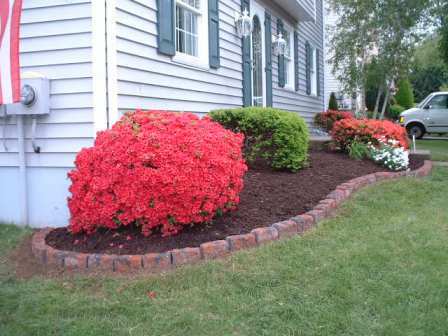 In gardens, they are often installed without concrete with the soil compacted along the bottom and against the sides of the cobblestones. 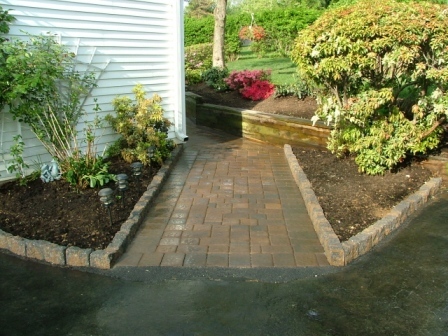 Also, see examples of decorative concrete edgers and brick used as edging below the cobblestone examples. 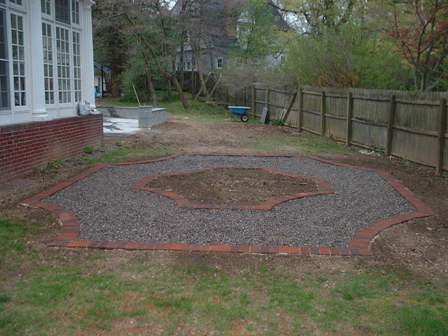 Jumbo Cobblestones installed as a patio border vertically in concrete under a fence between properties. 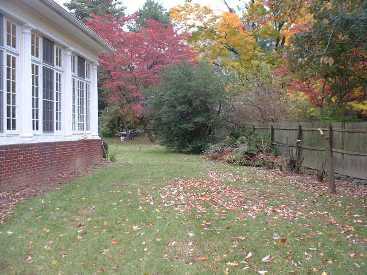 Regular sized gray cobblestones are used lengthwise here bordering an informal pea gravel walk. 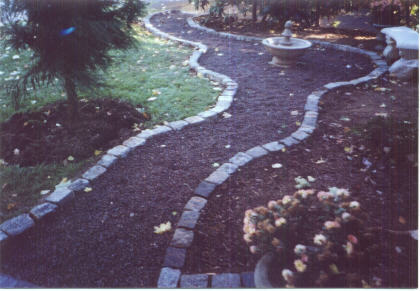 Jumbo Pink Cobblestones installed as a border vertically in concrete between walk and bed. 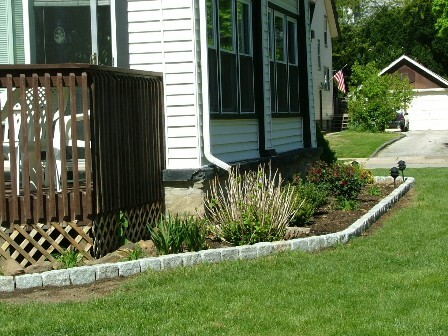 Jumbo Gray Cobblestones installed as a border vertically in soil between lawn and bed. 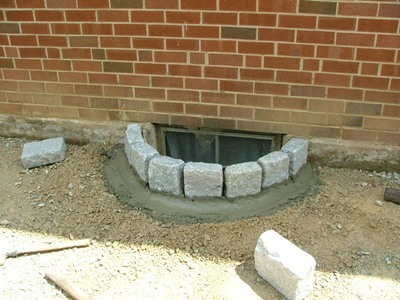 Jumbo Cobblestones installed in concrete to improve the appearance of the window well. 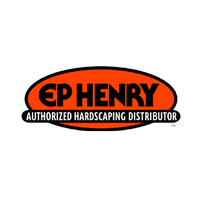 EP Henry Curbstone, and other brands of man-made edging stones come in various colors to match paver patio and wall stones. 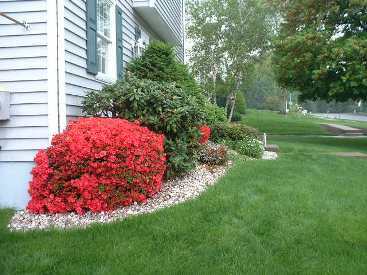 They are made in about the same size as cobblestones, with a wall stone or cobblestone texture on at least two sides. 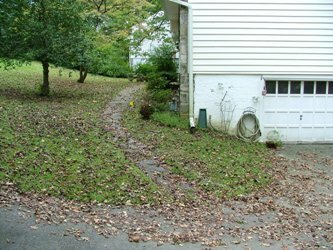 Generally at least half the edger should be buried for stability. 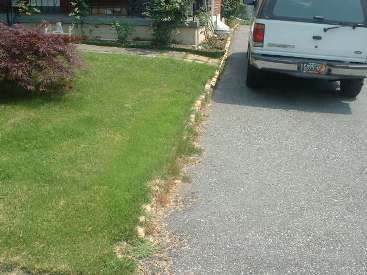 Edgers can be used in hardscaping and landscaping applications. 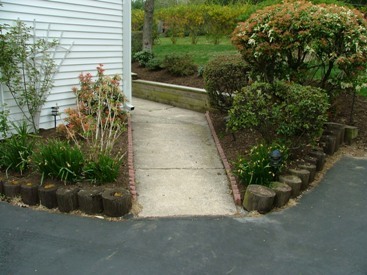 EP Henry Curbstone are commonly installed with concrete along driveways and when edging patios and walks. 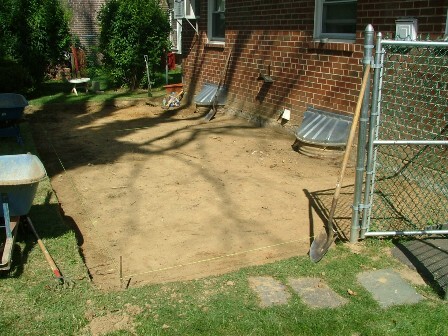 In gardens they are often installed without concrete with the soil compacted along the bottom and against the sides of the Curbstone. 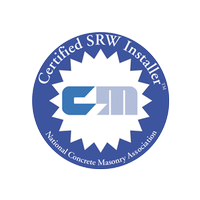 Brick and concrete pavers can also be used either upright or laid flat at ground level as edging, borders, and mowing strips. 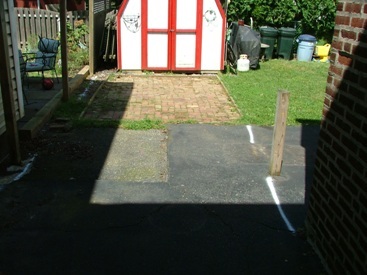 Used upright, generally at least half of the brick or paver should be buried for stability. 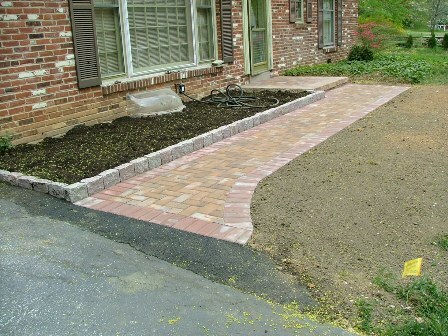 Brick and paver used as edging can be used in hardscaping and landscaping applications. 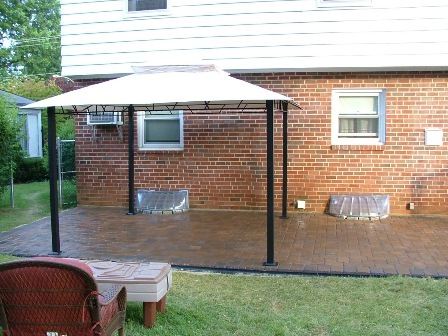 Brick and pavers are commonly installed with concrete along patios and walks. 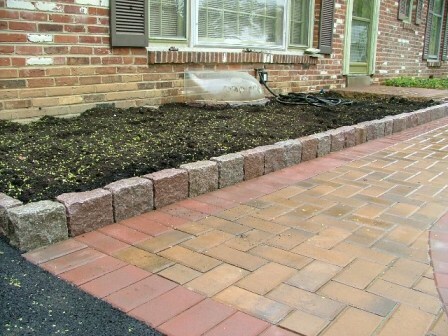 In gardens they are often installed without concrete with the soil compacted along the bottom and against the sides of the brick or pavers. 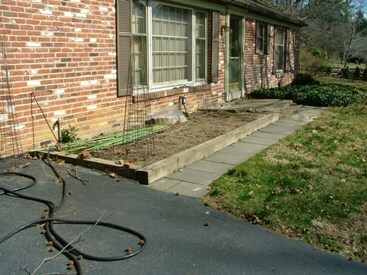 Brick laid flat and held in place with concrete. 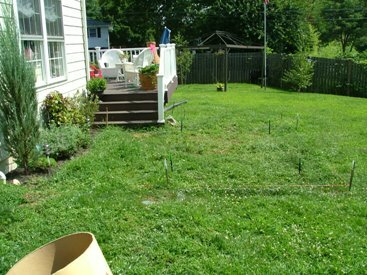 Bordering grass, pea gravel and landscape beds. 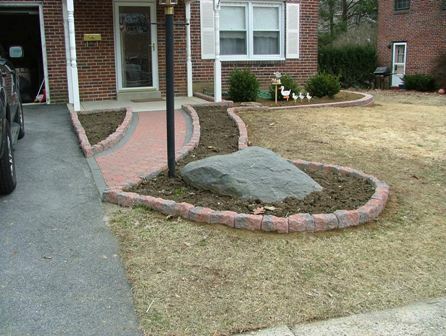 River Rock comes in many sizes that can give different effects when edging. 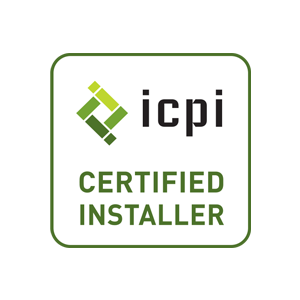 It is somewhat indestructible, and very easy to install, so labor costs are much less. 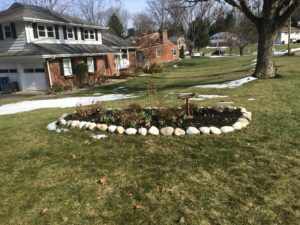 Larger stones make more of a statement and can make a bed stand out much more than cheap plastic edging so commonly used.